Earlier this week, I showed you a cute little Decorative Thanksgiving Memo Board I made with the awesome craft supplies I received in a Craft It! box from Elmer's. 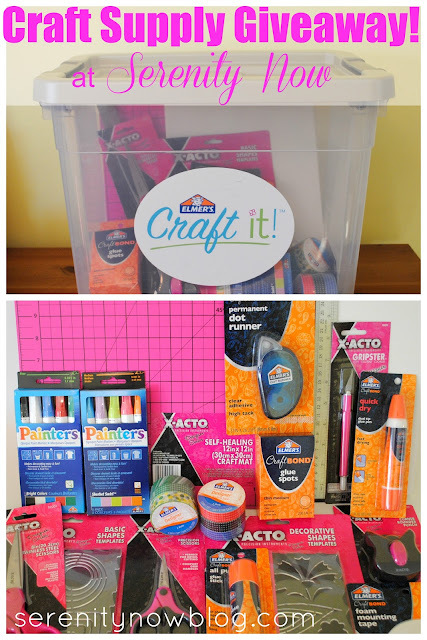 Today, I'm giving away a Craft It! Supply Kit to one lucky Serenity Now reader. Keep reading to enter! With the holidays coming up, there are all sorts of crafting opportunities...for friends, family, or your own home! That's a lot of crafty fun, and you could win it all! If you'd like to win, use the Rafflecopter form below to enter. Please note that I do verify entries! Giveaway is open until 12 am on Monday morning. Good luck! I like the idea of the recycled flower vase and I think it's one I could do with the kids! Cute idea! Great giveaway.. can't wait to win. This is a great giveaway and I would LOVE to win. I like any and all crafts especially ones to try with my grandson and nieces!! Thanks so much for the opportunity!! Happy Thanksgiving!! one of theh andmade ornaments is something that I would like to try with my son caleb! I am looking forward to making ornaments this year with my daughter! I would like to cut out some felt shapes and have my kids make ornaments. This year they get their own tree and it would be fun to have some handmade ornaments on it. My girls and I would luurrve to try the glitter glue to make some ornaments. Great giveaway! I am going to make personalized ornaments to go on our tree! Much more special than the purchased ones. First time ever to enter a contest, so here's hoping for beginner's luck! I'm working on glitter ornaments, made 4 so far & they turned out great .. very fun & easy. Now I need some paint markers to personalize. I loved reading about your box from Elmer's and your cute creation--I can't believe they provided another box for you to give away! I've been a fan of Elmer's for so many years, but I had no idea they made so many products. For instance, I looked at their DIY product section. I knew about their Carpenter's Wood Glue, of course, but didn't know they made sealants and repair products. I've never been disappointed in any Elmer's product, so I'll be sure to look for some of these! ANY craft! I haven't crafted since I started school and I miss it so much! The Elmer's design tape looks interesting. So many uses! This is AWSOME (<---said in a sing-songy voice). What a wonderful opportunity to receive some really cool items in time to finish all your Christmas projects! Thank you! what a wonderful give away! I hope good ole raffle copter picks me!!!! an advent calendar! thanks so much for the chance! I love Elmer products and want to try them all! Love the glue sticks. They are the best. Want to try the adhesive. I love all those products. Thanks for the chance! I would love to make cards and candles for these holidays. I'm not on facebook, but the wood turkey looked really cute, and I loved the silver spiders on a string! I'm going to check Fiskar's facebook page regularly now to see what they have that's new. I could use these products at school or at home. Did I tell you that my county provided one box of staples as my school supplies for the year? I could not believe it. Enjoy the craft ideas and really love this give away. My family is one of 'those' families. I live with my daughter, son in law, three grandchildren 16-14-12. We do things from furniture building to needle crafts to drawing and writing. Always looking to do other things and this is definitely right up that alley!! I would love to use the paint markers on ornaments! Thanks so much for the giveaway!! I want to make an advent calendar with those paint markers! What a fun giveaway! I really want to try making soap or candles this year. What a great box of goodies! I would make all kinds of Christmas crafts like gift tags, ornaments, neighbor gifts, etc. What an awesome giveaway! So much crafting awesomeness! FUN :) Thanks for the chance to win! Yes, I've just spent hours perusing your site....every 20 minutes I look at the clock and think "...but wait..ooh, oooh, one more post...", sigh. I'm a craft addict. I LOVE your Thanksgiving Display Board. It's so stinkin' cute! I'm going to make mine with some retro Christmas fabric I found and print out Holiday sentiments on paper (family, sleigh bells, away in a manger, etc). I would really love to find a great recipe for DIY dough ornaments.. most are too rough looking.. about 10 yrs ago my daughter and i made some and they were amazing.. looked just like thin sugar cookies... but lost the recipe.. think it would be a wonderful family DIY activity. I want to use the paint markers to make personalize greeting cards for family members. Ornaments for sure. The kids would love it. I can't wait to make ornaments with my kiddos again this year. It's become a family tradition and we have so much fun. I'm in love with making garlands! I would love to make some ornaments for my new grandson.